An interesting thread went up on Reddit Singapore yesterday. 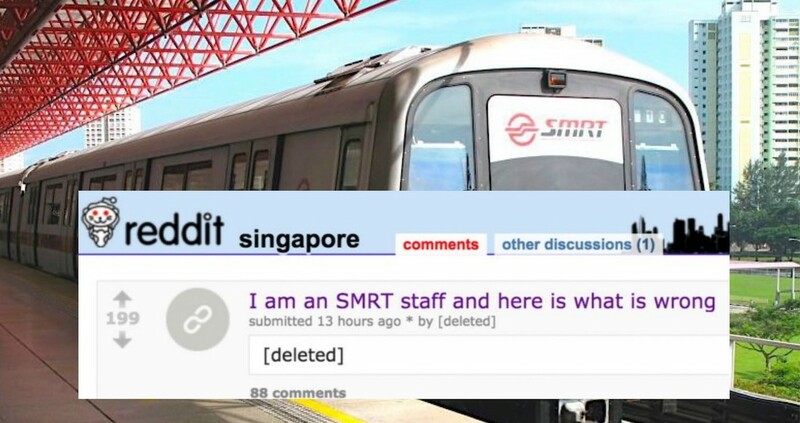 Titled “I am an SMRT staff and here is what is wrong”, the thread begins with the writer introducing themselves as a Station Manager. A little disappointingly, the thread is not about the breakdowns. However, it does portray SMRT as “basically a swamp filled with leeches”. In all honesty, the thread reads a bit like a rant, and we encourage you to take it with a pinch of salt. The main thread has been summarised here, but here’s the original thread. The writer begins their diatribe with the Standard Operating Procedure (SOP). SMRT problems have been worsening since the “cable tie” problem, the writer say. But the main problem is that station staff are lazy. Complacency from behind an “old bird” (long-term employee) sets in and so, many choose to slack off. And while the writer does admit to work boredom, they can’t tolerate that many colleagues “sleep, play games or even just lepak (loaf around)”. At one station the aircon went out [and] the Station Master did not deploy fans because [they] wanted to sleep. One recent change at MRT stations was the stopping of EZ-link top-ups at passenger service counters (PSC). Initially considered a move towards a cashless future, the writer reveals a darker side to the truth. After all, they are the ones attending conferences and whatnot. We are the ones who did it but we only cut bonus or [receive] “strongly worded” emails. […] Most of the time, our uncle Desmond and Khaw take the blame. Neither do they need to worry about being fired as there is collusion with supervisors. The SMRT is just basically a swamp filled with leeches. Top to bottom, all of them like your NSmen: lazy, chao keng, siam and arrow people. “Actually, I also don’t know [how to fix],” the writer concludes. You need to remove this people, they already got the mindset of not doing work. What about you, do you agree with what has been shared?